Pumpkins are some of the most versatile vegetables you can grow, and in this guide, we’ll show you how to grow pumpkins, care for them, and harvest them. A popular vegetable all throughout the world, pumpkin has hundreds of different uses from culinary to decorative, and there really is no shortage of things you can do with them! Keep reading on how to grow pumpkins in your garden! 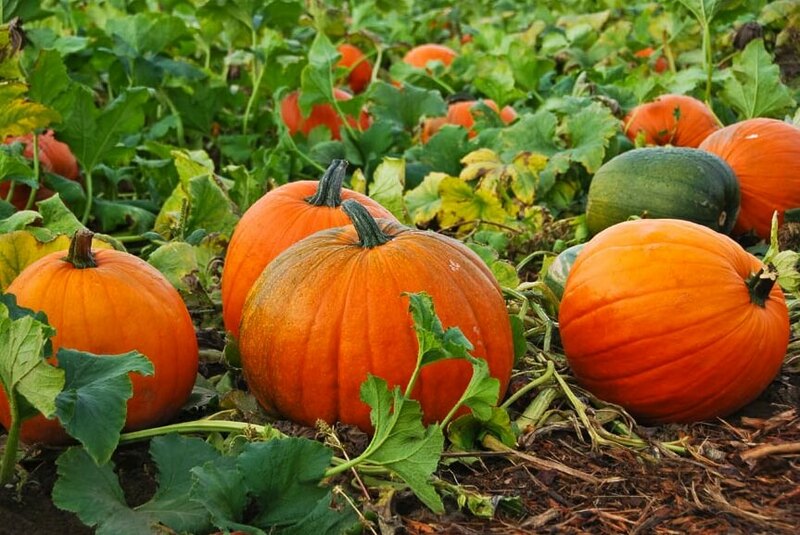 Before planting pumpkins, keep in mind that they have a very long growing season (75-100 frost-free days), therefore you’ll need to plant them from May (northern climates) through July (extremely southern climates). Also, do not plant pumpkin until ALL danger of frost has passed and soil is warm and workable. Pick a site with full sun and lots of space so that the vines can sprawl out. Vine varieties will need about 50-100 square feet per hill. If you don’t have the space, simply plant the pumpkins at the edge of the garden and sprawl the wines outside the garden or on the sidewalk. You can also grow pumpkins in 5-10 gallon pots or even choose miniature varieties. Choose very rich soil that is well draining. Mix lots of compost and aged manure in the planting site before sowing. Pumpkins grow best when planted directly into soil. If you have a short growing season though, sow seeds indoors 2-4 weeks before the last spring frost. Wait until soil is at least 70F or more before sowing the seeds. Plant seeds in rows or “pumpkin hills”. Prepare hills with an abundance of old manure dug deep into the ground (12-15 inches). Plant the seeds 1 inch deep and space hills 4-8 feet apart. Pumpkins should germinate within 1 week. Once plants are 2-3 inches tall, thin to 2-3 plants per hill . If planting in rows, sow seeds 6-12 inches apart in rows 6-10 feet apart. Cover pumpkins early in the season to protect from cold and pests. Pumpkins are very thirsty plants, so make sure to water one inch per week. Water deeply and steer away from watering the foliage. Mulch around the seeds to keep in moisture. Fertilize on a regular basis with a high nitrogen formula in early growth. Give your pumpkins regular treatments of manure or compost. Snip the pumpkin off the vine with a knife. How to Grow Pumpkins was last modified: May 14th, 2018 by Aniela M.
Thanks for sharing! I am excited to try thinning out more and then care for the individual plants more intensely.